The Moving Child Films I (2016), II (2019) and III (2019) were conceived and birthed by Director/Producer Hana Kamea Kemble. Long engaged in writing, photography, music, dance and media arts, Hana is also a Registered Clinical Counsellor (BCACC) and Board Certified Dance/Movement Therapist (ADTA). She currently lives in the traditional territory of the Tsilhqotin First Nation in the Chilcotin region of British Columbia, and spends time in Vancouver BC training a variety of mental health professionals in methods and applications of Dance/Movement Therapy (www.westcoastdmt.com). Hana has travelled internationally to share her films and help professionals and parents understand the importance of dynamic and expressive movement to children’s wellness. The Moving Child Films I, II and III were envisioned as educational tools for caregivers and educators of children to help expand understanding of the important needs that movement meets for children; the need for nurturing/cuddling, the need to communicate, to feel good, to express oneself, to self-soothe, to self-regulate, to cope with the environment and to learn to interact socially, to name a few. In making these films over a nine year period, Hana interviewed close to 30 experts in a variety of fields and travelled to film scenes all over North America. Many thousands of hours went into the creation of these films and their completion is in large part due to the skill and dedication of an incredible film team, namely Jacki Huntington, Rheanna Toy, Gloria Mercer, and Melissa Flagg, with support from Kenna Fair . Having completed the trilogy of Moving Child films, Hana is now dreaming of making one more film The Frozen Child, which will focus on healing intergenerational trauma through movement therapy, a subject dear to her heart and personal and professional experience. 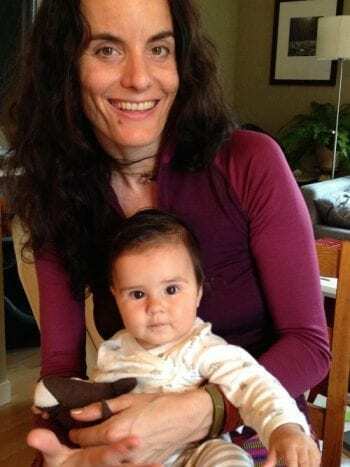 Hana holds a Master’s degree in Somatic Psychology and Dance/Movement Therapy from Naropa University (Boulder, Colorado 2001) and is a Board-Certified Dance/Movement Therapist (BC-DMT), Registered Clinical Counsellor (RCC), Laban/Bartenieff Movement Analyst (CLMA) and Registered Yoga Teacher (RYT200). Hana finds her deepest bliss in songwriting. Please visit www.hanakamea.com to hear selections of Hana’s music. Hana enjoys presenting The Moving Child Film for diverse audiences. Workshops and presentations are available and can be facilitated in English, French or Spanish. The Moving Child Film has been (and continues to be) translated into several different languages (using subtitles) and the latest translations are up on our VIMEO site (available through our Store).